Anza’s first camp after reentering California from Mexico was chosen for plentiful pasturage, knowing that there would be water the next night at Yuha Well. This site is just south of Hwy. 98 near the turn off for Yuha Well. The area is dominated by the ubiquitous, but unpalatable, creosote bush. This being a very dry year, other vegetation at the site was largely limited to very stunted wildflowers and almost no grasses. 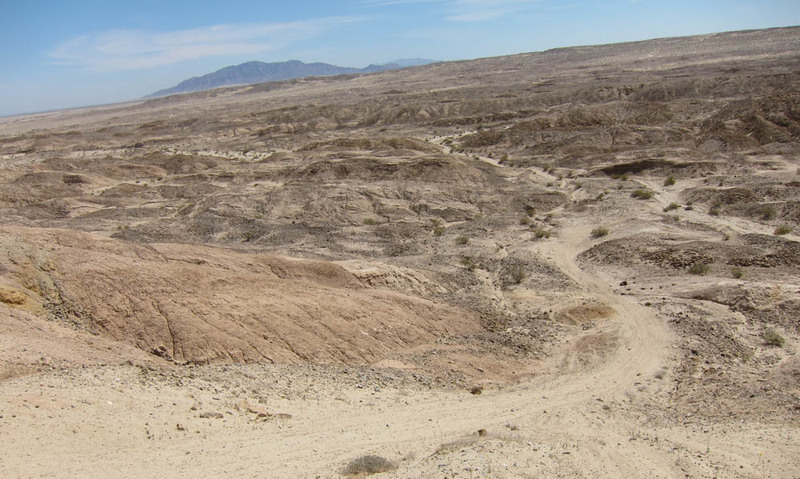 The years of the Anza expeditions were wetter and vegetation must have surpassed 2012. Yuha Well was long used by travelers crossing the desert before the first Spanish explorations. Knowledge of it, shared by the Indians, was crucial to the success of the Anza expeditions. Entering the basin is more ominous than promising. At seven o’clock in the morning we took up the march over good country towards the northeast, and having gone about a league and a quarter we reached the wells mentioned, and when they were opened they poured forth an abundance of the finest water. We called them Santa Rosa de las Lajas. –Anza, March 8,1774. Anza’s men dug out pits, probably in the floor of the wash, to obtain water for themselves and their livestock. Their enthusiasm for the water quality may have been heightened by how little potable water they had encountered since crossing the Colorado River. 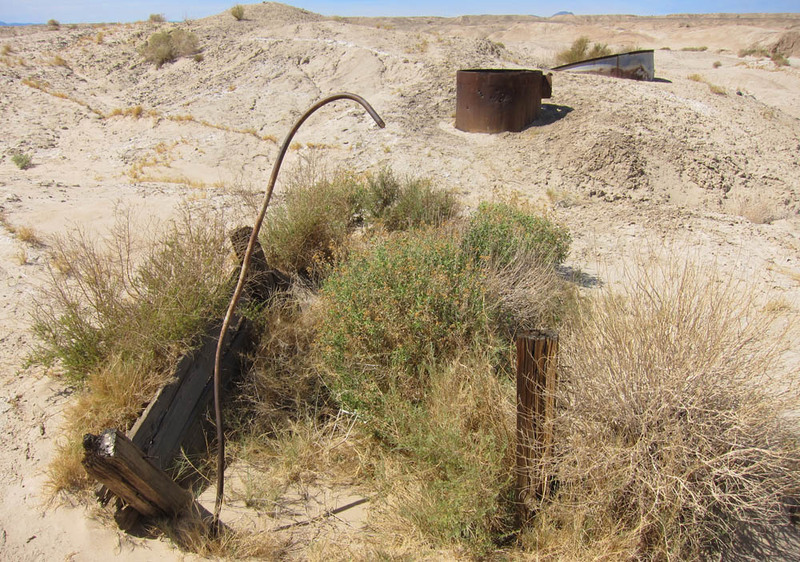 To avoid being filled in every time water flowed down the wash, in later years, cased wells were dug up on the banks of the wash. But in time, these wells too filled in, probably by blowing sand. For a dirt road in the desert, the route into Yuha Wells from Hwy 98 is very easy to follow. The starting point is unmistakable due to a very tall radio tower at the roadside. 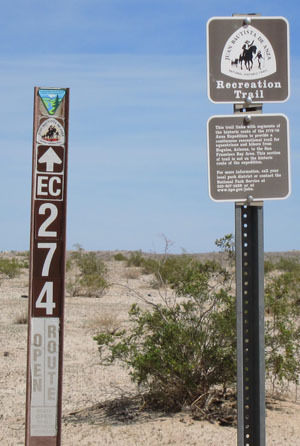 Updated signage, along with a map and audio tour available from BLM, make the route clear. 2WD with clearance would be adequate to get to the overlooks of the Yuha Basin. Getting down into the basin is best with 4WD, but a pickup with a granny gear, or the venerable VW dune buggy would do just fine. Like elsewhere in the desert, rainfall was very scarce this year and no moisture was evident anywhere. 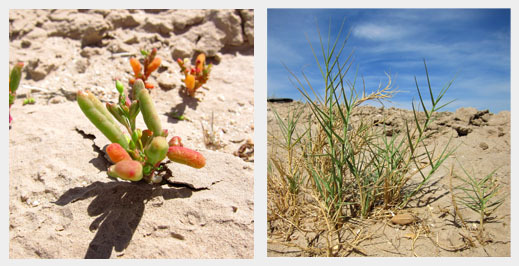 The presence of the salt-marsh plants pickleweed and saltgrass, suggests that these days, even in wet years, drinkable water would be hard to find. While we were there, a crew from American Conservation Experience arrived and started working a couple hundred yards up the wash. They have a contract with BLM to reduce and remediate visitor impact in this fragile desert ecosystem. Note: this was a repost to workaround maillist problems. 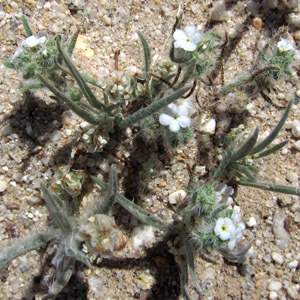 This entry was posted in Anza Expedition, Aquatic Habitats, California, Desert by CreekSnooper. Bookmark the permalink. Monkey Hill Trail, for hikers and horses only, crosses the main route. To the left it goes to Sheep Canyon Camp.